From coloring to art journaling, pen and paper are making a comeback. People of all ages feel the need to slow down and take a break from the tyranny of gadgets and the digital wave that has overcome us. Consider how texting, social media, YouTube, Netflix, news, polls, tickers, steps and calories can take over your life—if you’re not careful. Not every person is equally gifted, but everyone is creative to a degree. Some may create beautifully illustrated verses in their journaling Bibles, while for others, staying within the lines is as creative as it gets. Bringing creativity to our world is a beautiful way to honor God. Creativity is also a built-in cure for healing from the stress-inducers of everyday life. It is an outlet for emotions, desires and dreams. If you consider the explosive growth of coloring books for adults, consumers seem to agree that such an outlet has great value. The coloring trend started in 2012 with the release of The Creative Colouring Book for Grown-Ups in the U.K., and it quickly spread to France and then to the U.S. But the adult coloring book category really picked up steam with the release of Johanna Bashford’s The Secret Garden and Enchanted Forest, which each sold millions of copies. Many booksellers reported better-than-expected Christmas sales due to coloring books for adults. As we move into spring 2016, there are no signs of this trend slowing down; in fact, sales continue to climb. Of Amazon’s top 20 best-selling books, nearly half are coloring books! Sadly, although the category is growing, it now includes themes ranging from mandalas to movies to crude and off-color topics. This created an opportunity for Christian publishers to serve their customer base with wholesome, God-glorifying alternatives. Last summer, Christian Art Gifts released Today Is Going to Be a Great Day, which became an instant best-seller. By fall, it was showing up on most of the best-seller lists tracking Christian book sales. 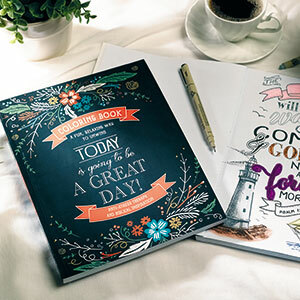 With many publishers—from Charisma House to FaithWords to Warner Press and more—jumping on the bandwagon, the coloring book category may seem over-published, but there are still plenty of sales ahead for the best products, especially since most consumers buy multiple coloring books. The category is also expanding to include new products such as coloring cards, devotionals and promise books. 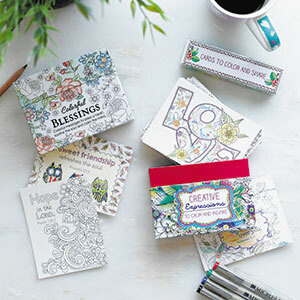 Vicki Geist, owner of Cedar Springs Christian Stores in Tennessee, was one of the first Christian retailers to recognize the sales potential of the coloring book category. Geist sees the category as here to stay. Rachel McRae, senior book buyer at LifeWay Christian Stores, has enjoyed offering Scripture-themed coloring books. Art journaling is related to the creativity inherent in coloring. Art journaling is a wonderful way for visual learners to organize their thoughts and focus on a particular text. The right brain is stimulated, and words come alive in the mind. Art journaling gained momentum around 2011. Fueled by social media, it quickly became the new scrapbooking. In the Christian market, art journalers first adopted Crossway’s journaling Bibles. “We’re thrilled that the ESV Journaling Bible has been at the forefront of helping to facilitate thoughtful interaction with the biblical text for thousands of men and women,” said Matt Tully, marketing director at Crossway. Zondervan created a full-color Bible with illustrated text (NIV Beautiful Word Bible). Tyndale House Publishers (Inspire NLT) and Christian Art Gifts (My Creative Bible KJV) took a different route, creating Bible editions that can be used by journalers of all abilities. They feature hundreds of line-art images while still providing plenty of space for the user’s notes or illustrations. Through art journaling, readers creatively engage with Scripture while meditating on the meaning of the words as they fashion them into an image. Truth is etched into their memory. “Biblical literacy is alarmingly low among Christians today, and the creative art-journaling phenomenon is drawing people into the Bible in masses,” said Kim Johnson, Tyndale’s Bible line manager. Bookstores and libraries everywhere are hosting events ranging from art-journaling workshops to coloring parties. The trend toward creative expression produces a unique opportunity for Christian retail stores to plan exciting in-store events that could generate much-needed traffic. Heinrich Johnsen is the owner of Christian Art Gifts, a leading provider of gifts, books and Bibles in Bloomingdale, Illinois.